There is nothing worse than a rooftop that fails to keep out the rain and snow. Even a small amount of damp can have an impact that can lead to serious issues developing. As such, it’s important that you ensure that the waterproofing of your roof is up-to-scratch. At JJ Roofing, we stock the incredible Icopal Enviroflex™ Liquid Waterproof Coating – the perfect choice for any domestic or commercial property. The Icopal Enviroflex™ is the go-to solution for any scenario which requires the use of an exposed membrane. Whether as part of a new build or for use in a refurbishment project, this system is your assurance of first-class results. Plus, the Liquid Waterproof Coating is ideally suited to situations where traditional methods might fall short. 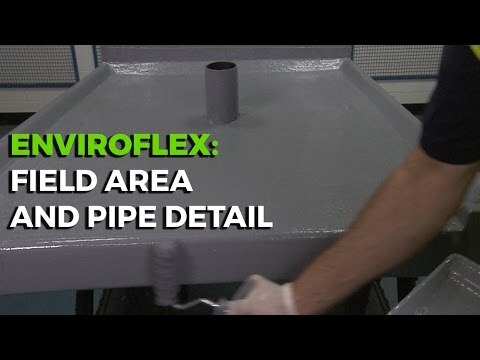 What exactly is the Icopal Enviroflex™ Liquid Waterproof Coating? Put simply; it is a single component polyurethane based, moisture curing coating. This system is typically applied in multiple layers in conjunction with a polyester reinforcing fleece. The Icopal Enviroflex™ features a vapour permeable design. While traditionally, this system would be used in areas of limited foot traffic, should its use be required in a heavily trafficked area, then this is also possible. What makes this possible is the Enviroflex™ anti-skid walkway system. When used in conjunction with this system, the Icopal Enviroflex™ can serve as a reliable access route. Here at JJ Roofing, we supply the Icopal Enviroflex™ Liquid Waterproof Coating in mid-grey and white and these are available in 4 and 15-litre tins. Preparation couldn’t be easier, and with straightforward instructions to follow, even an amateur can apply the Icopal Enviroflex™ with minimal hassle. Simply ensure that the substrate is sound, clean, dry and free of frost, dust and debris, and any material which would hinder adhesion. Residual moisture in concrete substrates must not exceed 5% in the upper 2 cm. It’s vital that the Icopal Enviroflex™ be applied only when atmospheric and substrate temperatures are greater than 5 °C. The surface of the substrate should be clean and dry and must be 3 °C above the dew point. If the surface is below or at dew point temperature, then moisture can form at the surface and affect coating adhesion and curing. For optimal ease of application, the Icopal Enviroflex™ Liquid Waterproof Coating should be above 12 °C. We also recommend that personal protective equipment (PPE) be worn for your own protection. The application method of the Icopal Enviroflex™ follows a straightforward process that, if followed, should deliver the desired results. Prior to application, the substrate must be primed with a suitable Enviroflex™ Acrylic Primer or EP1 Primer and allowed to cure. Once this has been achieved, open and stir the Enviroflex™ Liquid Waterproof Coating taking care not to over stir as this can introduce air. In the event that air bubbles occur, allow the coating to settle for 5 minutes, otherwise, place the container on top of a larger bucket of hot water. This should be done when the coating appears thick as raising the temperature of the coating will improve viscosity. In accordance with the combined system coverage rates above, apply approximately 1/3rd of the Enviroflex™ Liquid Waterproof Coating above the primed substrate as the base layer using a brush or roller. Immediately apply the Enviroflex™ Reinforcing Fabric into the base layer and roll the surface with a perlon roller to eliminate potential air bubbles. Overlaps in the reinforcing fabric should be a minimum of 75mm. The next step is to immediately apply the remaining 2/3rd of the Icopal Enviroflex™ Liquid Waterproof Coating above the reinforcing fabric as the top layer. Once this is done, roll out evenly until complete saturation is achieved. Ensure the overlap areas (above and below the overlapping fabric) are fully saturated to maintain continuity of the waterproofing system. Typically, we suggest applying the Icopal Enviroflex™ ‘wet-on-wet’ as this allows for full membrane application in a single process. Depending on the porosity and texture of the substrate, the Icopal Enviroflex™ should be applied at a rate of approximately 1.2 to 1.4 L/m². Once applied, the system will be fully rainproof after 20 minutes; can be walked on after approximately 4 hours and cured after approximately 72 hours. Here at JJ Roofing, we are confident in the performance of the Icopal Enviroflex™ Liquid Waterproof Coating. In fact, we’re certain that once you’ve used this product once, you’ll wonder why you ever used anything else.